A clause in the last will and testament of English scientist James Smithson eventually led to his estate being left to the United States "to found at Washington, under the name of the Smithsonian Institution, an establishment for the increase and diffusion of knowledge among men.” There was much debate as to what constituted such an establishment, but many of the proposals involved a library in one form or another. The library was specifically mentioned in the legislation signed in 1846 which officially established the Smithsonian Institution and Charles C. Jewitt was appointed as Librarian in 1848. Traditional definitions of librarians generally include references to books. After all, the word “library” comes from an Anglo-French word meaning “collection of books” (the Online Etymology Dictionary provides much more detailed origins). In addition to managing the books themselves, librarians are often responsible for maintaining information about the books. After a falling out with Secretary Joseph Henry, Jewitt was dismissed in 1855 and Jane E. Turner, the Smithsonian’s first female employee, was assigned to manage the accession records for the books, though she was not given the title of “Librarian.” The accession records were paper files, similar to those for objects. What started as a one-man operation has become a system of 20 branch libraries and 109 staff. The Libraries have a dozen staff dedicated to cataloging alone! Cataloging involves recording, maintaining, and presenting data about the individual items in the collections in order to assist researchers (and the librarians) in finding the materials they need. The majority of the cataloged data is publicly accessible via the Smithsonian Institution Research Information System SIRIS, an online catalog of library, archives, and specialty research at the Institution. 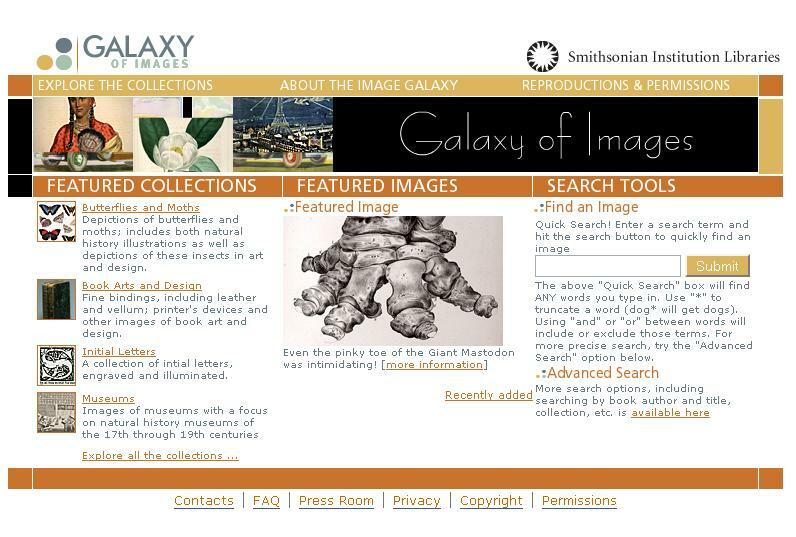 The Libraries also create specialized websites to allow the public to search or browse certain subsets of information which may or may not be available in SIRIS, such as the Galaxy of Images, a search tool for finding images of their collections. Did you notice that the word “book” wasn’t used at all in the last paragraph? There’s a good reason for that. Most libraries are no longer just about books. Books are still a large percentage of the holdings of most libraries (the Smithsonian Institution Libraries hold over 1.5 million volumes), but the percentage of other types of media is increasing every day. In particular, electronic resources such as born-digital images, reports, graphic materials, and databases are finding their way into library collections. In addition, libraries are digitizing materials that were originally in a hard-copy format, either to limit access to fragile items or to make them available to a larger audience via the internet. For digitized materials, information about the surrogate needs to be managed in addition to information about the original. Furthermore, information about the relationship between the two and about the digitization process needs to be maintained as well. This may sound complicated, but that’s why the reference librarian still exists. Reference librarians are experts at finding and evaluating information. Through their training, their experience, and their formal and informal networks, they keep track of what resources are available, what they are best used for, and how to create the perfect (or at least really good) search string. Just last month, Marilyn Johnson published This Book Is Overdue: How Librarians and Cybrarians Can Save Us All, portraying (and embellishing) the lives of a number of modern real-life librarians. While the title statement may be exaggerated, the proliferation of information available, particularly via the internet, has ensured that the librarian is just as relevant today as he or she always was. The technology and tools have changed, but the librarian is still responsible for managing information about books and other resources as well as creating products and providing services which allow individuals to find that information. A full history of the Smithsonian Institution Libraries has been compiled on its website. For more information about the library profession, visit the website of the American Library Association. This is part of a series of posts giving a behind-the-scenes look at the jobs involved in managing the visual and textual materials of an archive. Also see a post describing the work of a Photo Archivist, an Archivist, and a Registrar.